In lieu of flowers memorial donations may be made to Union Hall Baptist Church and left at the funeral home. 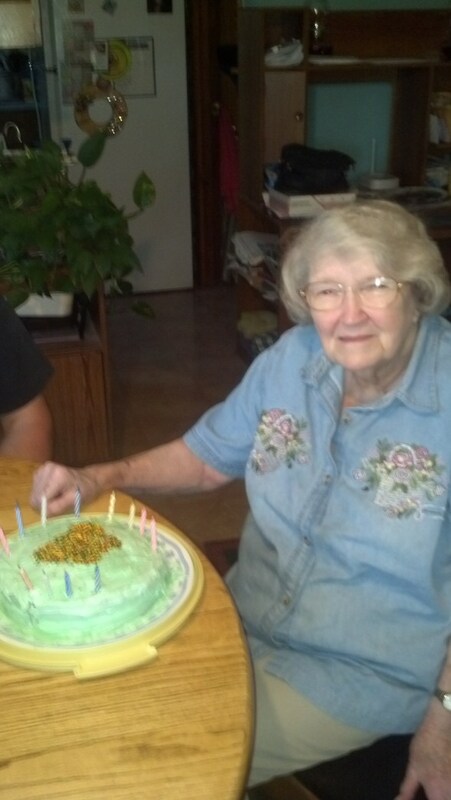 Margaret Elizabeth (Nicely) Borders, age 85, of El Dorado Springs, MO, passed away on Saturday, April 11, 2015, at her daughters home in Tecumseh, KS. Margaret was born on July 1, 1929, in Independence, MO, to Oary Nathan Nicely and Audrey Carey Nicely. Margaret was a three-pound baby who was put in the top dresser drawer to keep warm. She wasn’t expected to survive and was a miracle baby. She was raised in Stoutland, MO, on a farm and moved to Independence, MO, when she was fourteen. She graduated from Northeast High School in 1947, and began working at Hallmark Cards. In 1948, she met the love of her life, Richard Oakley Borders, and they married on February 5, 1949. To this union five children were born: Richard, Jr., Larry, Stephen, John, and Lorraine. Margaret and Richard raised their children in Kansas City, KS, before moving to El Dorado Springs in 1984. She was a loving wife, mother, grandmother, great-grandmother, mother-in-law, daughter, sister, sister-in-law, aunt, and friend to many. Margaret and Richard helped establish Stony Point Baptist Church in Kansas City, KS, in 1957, and she was currently a member of Union Hall Baptist Church in El Dorado Springs. For many years she served the Lord by teaching Sunday School, leading women’s missionary groups, and organizing many church dinners. She truly loved the Lord. Margaret loved to read, bake cinnamon rolls and cherry pie, refinish antiques, quilt, drink hot tea with cream and sugar, plant beautiful flowers, and her cats. She especially loved being a true friend to all. She treasured everyone she met and loved calling her family and friends. She always tried to make everyone feel better. Preceding Margaret in death were her husband, Richard, in 2007; her son, Richard, Jr., in 1958; her parents; her brother and sister-in-law, Kenneth and Virginia Nicely; her sister and brother-in-law, Alice and Bruce Wilson; and her sister, Jeanette Nicely Borders. Survivors include her sons and their wives: Larry and Brenda Borders of Basehor, KS; Rev. Stephen and Karen Borders of Vacaville, CA; and John and Traci Borders of El Dorado Springs, MO; her daughter and husband, Lorraine and Roy Rissky of Tecumseh, KS; thirteen grandchildren: Rendi (Josh) Cox, Larry (Sarah) Borders, Jr., Rebecca Borders, Elizabeth Borders, Ben (Abby) Borders, Anna (DJ) Kaufman, Rachel Borders, Matt Borders, Makayla Borders, Brandon Borders, Michelle Rissky, Kellie Rissky, and Nicole Rissky; seven great-grandchildren: Kaylee, Alyssa, and Jaycee Cox, Shari Jo and Jayme Borders, Kate and Audrey Borders; sister and brother-in-law, Mary and Bob Simpson; brother and sister-in-law, Jim and Kathy Nicely, sister-in-law Vivian Hughes; brothers-in law and sisters-in-law: Neil and Joyce Borders, Jay and Joan Borders, and Lee and Arlene Borders; many nieces and nephews; and a multitude of friends. Funeral services for Margaret Borders will be held on Friday, April 17, 2015, at 11:00 a.m. at Bland-Hackleman Funeral Home with Rev. Don Barger and Rev. Stephen Borders officiating. Interment will follow at Fort Scott National Cemetery at 1:30 p.m. The family will receive friends from 10-11 a.m. immediately preceding the service.